Mounir Khouzami is an “intercultural bridge builder” with a background in strategy, innovation, change management and banking. His engagements are driven by the conviction that “there are too many walls and not enough bridges”. This is why Mounir initiated, co-founded and presided since inception in September 2013 the Swiss Arab Network (SAN), an international NGO striving to bridge gaps, promote sustainable exchange and intensify mutual understanding among Swiss and Arab people. In this capacity, he is on a regular basis giving speeches and commenting for the media on topics like Halal Economy or GCC Tourism in Switzerland. He developed with a team of SAN experts the first ever educational guide on Halal Tourism in Switzerland. Since October 2018, he acts as SAN’s Chairman of the Advisory Board, Executive Board Member and Co-Founder. Mounir is also initiator of numerous initiatives and partnerships with other like-minded organizations and government institutions. One key initiative together with the RFI Foundation was the creation of the Responsible Finance & Investment (RFI) Summit and its organization in 2017 and 2018 in Zurich and 2019 in Abu Dhabi. As SAN and RFI share the same visionary purpose, in which two different financial systems respectively cultures are brought together by working out the commonalities instead of the differences, Mounir engages strongly in this joint initiative. Consequently, he joined the Board of Trustees of the RFI Foundation in October 2018. For his engagements to thinking beyond, pushing boundaries as well as connecting the dots, he was awarded and included into the prestigious circle of the ISLAMICA 500, the “world’s most prominent and influential personalities in the Islamic world and economy”. 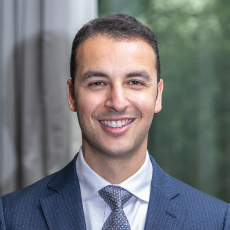 Besides that, Mounir has been driving as a consultant in the last decade key strategic initiatives within the wealth management industry for UBS, Wave Stone Consulting and Merrill Lynch in New York. Topics ranged from digital banking, organizational health, market access to sustainable and impact investing. He holds a diploma in strategy and innovation and was awarded a distinction from Saïd Business School, University of Oxford, a diploma of advanced studies in banking from the University of Berne and Rochester and a B.A. with a specialization in NPOs from the Zurich University of Applied Sciences.